Instructions: White cardstock is the background. Cut 2 strips of the striped patterned paper that are 1.25" wide. Cut 2 strips of the dark pink patterned paper that are 1" wide and tear one edge on each. Adhere these layers together and attach to the white cardstock background on the top and bottom. Find and cut out the small journal block with the decorative green border. Cut off one corner and add to the top of the layout in the middle. Paint both chipboard pieces with the white Distress Paint. Let dry. Using my finger and the gold Metallic Lustre, I added shading on both chipboard pieces. Using a liquid adhesive, add Crystal Clear glitter highlights around the oval frame. Die cut 1 scalloped oval mat from black cardstock. Die cut your photo with a smaller oval die. Adhere these layers together. Hand cut a piece of white cardstock to fit behind the oval chipboard frame. Adhere the matted photo to the white cardstock using 3D foam squares. Attach the chipboard frame to the white cardstock using 3D foam squares. Set aside. Die cut 2 Arianna Lace from white cardstock. Using circle dies, cut 2 large green patterned paper circles, cut 2 slightly smaller light pink patterned paper circles, cut 2 slightly smaller orange patterned paper circles, and then cut 2 slightly smaller again light green patterned paper circles. Adhere the smallest light green circles to the edges of the layout, then the light pink circles and then the dark green patterned paper circles. Adhere the orange circles to the white Arianna Lace and adhere on top of the dark green patterned paper circles using 3D foam squares. Add the oval chipboard frame piece using 3D foam squares in the middle of the layout. Stamp and die cut 1 set of the Large Camelia Carnation leaves in Early Espresso ink. Add color to the leaves using Green Apple ink and daubers. Stamp and die cut 2 sets of each of the large and medium Small Camelia Carnation images using Early Espresso ink. I added color to the dark pink carnations using Berrylicious ink and daubers, by just dusting the edges of the petals. I added color to the light pink carnations doing the same dusted edge technique using Blush ink. I added color to the orange carnations using Spiced Marmalade ink, and dusted the edges with Pumpkin Spice ink using daubers. 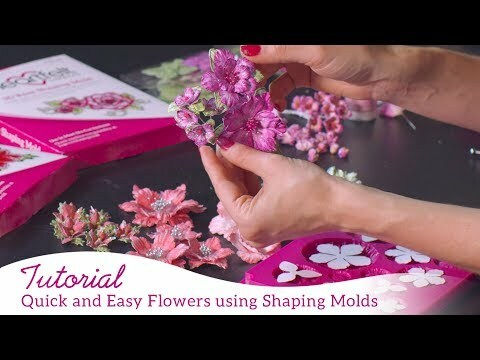 Using the 3D Floral Basics Mold, shape all of the flowers. I did a little additional shaping using my shaping tool. Assemble the flowers. Using a liquid adhesive add Crystal Clear to the edges of the petals. Adhere an orange and light pink carnation to the bottom right of the oval frame. Add leaves and buttons. I added a mini flower, with a pearl in the middle. Adhere the "adore" title to the bottom right hand corner of the layout. Add dark pink carnations to either side of the layout without leaves. Add an orange carnation to the top of the oval frame with a pearl in the middle and leaves. Also add buttons in a cluster around that area. Add a pearl to the patterned triangle at the top of the layout.